It is March. The vernal equinox is in exactly 15 days. And yet, New York City found itself blanketed in snow today. The snowfall was exquisitely beautiful. I found myself vacillating between becoming mesmerized by the beauty of the snow and feeling downright depressed because this has been a bitterly cold winter. This afternoon I taught a class held in a studio that has floor to ceiling windows. I felt like I was teaching in a snow globe. The beauty of the snow and the amount of focus each student in class had kept me fully present. I started class by asking the students to find the beauty in each moment, just as it was. We were all itching for spring, and yet, snow, beautifully pristine snow unsullied by the city’s hustle and bustle dirt, was piling up outside. There were several moments in class when I gave verbal cues and everyone adjusted into poses with greater clarity and safer alignment. There were several moments when I paused and asked everyone to breathe together, which created group cohesion reminding me we truly are all connected. It may not have been a perfect day, or a perfect class, but there were definitely moments of true beauty. 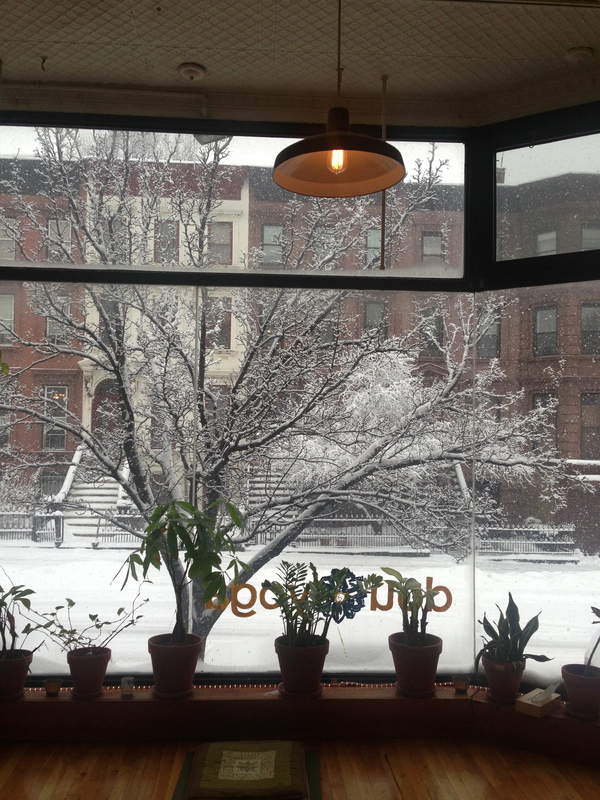 This entry was posted in Uncategorized and tagged beauty, snow, yoga. Bookmark the permalink.